Mother had her appointment at the USF Alzheimer’s Center this morning. Everything looks fine; pretty much the same as when we did the baseline neuro-cog eval about three years ago. Perhaps some very minimal decline, but really everything is great. 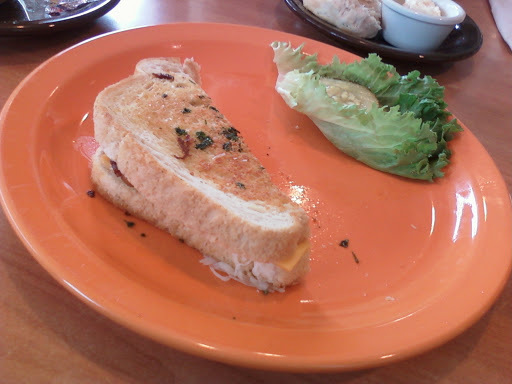 Afterward, we went to the Village Inn restaurant for lunch, where I ordered the Grown-Up Grilled Cheese (made with tomatoes and bacon). When it arrived, I was very pleasantly surprised to see their unique way of keeping that nasty pickle juice from getting on my sandwich and making the bread soggy. It made me very happy. Then, even better, when I got home, I was able to successfully transfer the photo I took from my cell phone to my computer via some clever chip adapters so I could share with y’all!